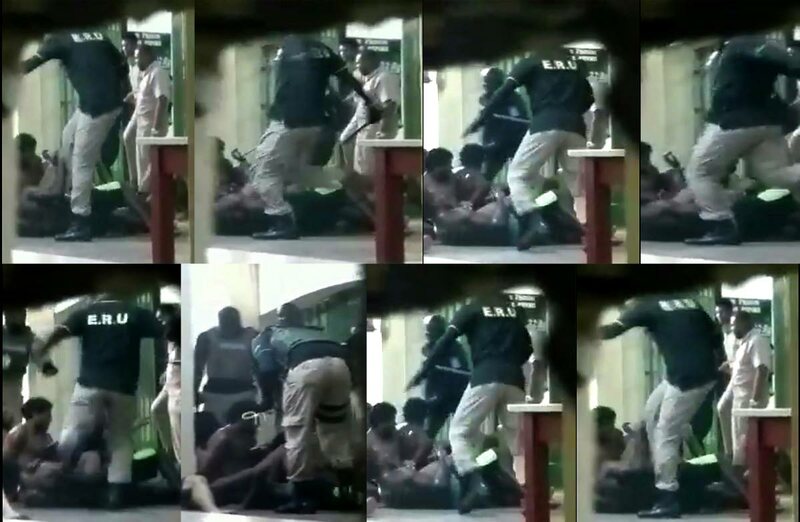 A composite photo of images from a video, posted on social media, in which prison officers are seen beating prisoners. Prisons Commissioner Gerard Wilson yesterday confirmed that an internal investigation is underway after a video showing prison officers, some masked, beating and kicking prisoners was circulated on social media. Wilson said he has seen the video and the investigation will be done to determine in which prison the video was filmed, and when. He noted the prison officers in the video covered their faces with balaclavas (ski masks), which would make it difficult to identify them. Wilson expressed disappointment over what he saw. “The same way I frown on prisoners attacking prison officers, I am against prison officers harming prisoners,” he said. Executive director of the prison fellowship Robert Payne Jr said initial investigations revealed the video was part of a larger exercise on Tuesday in which prison officers were searching the inmates’ cells and they refused to be searched. He said during this exercise force had to be used, but the force used adhered to the prison rules and regulations which governs the Ministry of National Security, and by extension the Prison Service. “Part of this exercise was recorded, and shared on social media so that it would lend to the opinion that excessive force was used,” Payne said. His assertion was supported by a news release issued by the Prison Service and signed by Wilson yesterday. Wilson said the officers faced several challenges during the lockdown and eventual search “inclusive of a major stand-off with inmates.” Wilson said it resulted in some prisoners sustaining non-life-threatening injuries and some having to be forcibly restrained, after “officers were met with improvised weapons and physical acts of violence and aggression.” He said the operation, during which a quantity of “unauthorised items” were found, was spearheaded by a senior official, who was present to ensure that the search was carried out professionally and with the minimum use of force. The video was released on social media on Tuesday night. It showed the inmates sitting in a huddle, surrounded by officers kicking prisoners and beating them with batons while they lay face down on the ground. Tie straps were then used to bound their hands. The video appeared to have been recorded by another prisoner. Reply to "Licks like fire behind prison walls"